Jackie Brown has won many ribbons for her long arm quilting. She has the same talent with domestic machines. Her basic machine quilting retreat has had much success. This retreat is a natural sequel for those individuals that have participated previously. 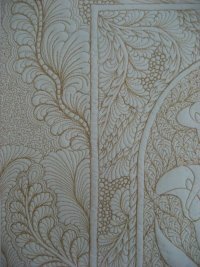 If you are already skilled with domestic machine quilting join this retreat to move on to the next level. For intermediate to advanced quilters, you may bring your own project or work on the whole cloth project pictured below on muslin. Or you can make a sampler of quilting technique which is displayed in our quilt store. Jackie will be there to advise and guide you on the process of you quilting your quilt. You may want to review any of the techniques you learned in the beginner class, or take it to the next level, and increase your skills by enhancing, feathers, crosshatching, circles and more. For the pictured whole cloth project you must have enough experience with free motion quilting, to learn this technique. This is very detailed stitching. Jackie has found a way to make your design look like it has movement and dimension with stitches. She will teach new background fills. She will also teach more about everyone's favorite "Feathers". How to enhance them by making them look like they have movement. You will also learn how to use them as a background fill. Beginners - This retreat will take you through the process of learning how to free motion quilt. You will start out with a marked panel that will help get you started on free motion quilting. Then you will learn how to mark a design on a small project and use a background fill to finish the project. 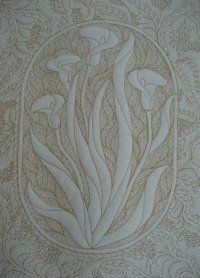 I will share with you the techniques I have used to make Free Motion Quilting fun and less stressful. 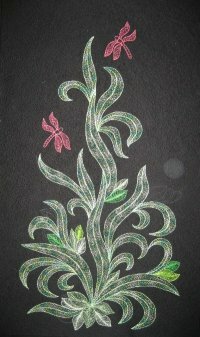 You will learn the different techniques taught in this retreat such as, Marking your quilt, Crosshatching, background fills, Piano Keys, Circles, Small Stippling, and of course you will learn how to make those beautiful Feathers. This retreat is an overnight stay at our retreat facility which is located behind the quilt store. This is for domestic sewing machines or Handi-Quilter sit-down unit (and other quilting units like this). Please let us know when you sign up--what type machine will you bring for retreat? You must be able to drop the feed dogs on your sewing machine for this machine quilting retreat. Hopping foot for your home sewing machine. skill builders panel #2(36 " x 45" in size) pre-order from Quilt Mercantile. Cost is $12.50. skillbuilders panel #1 & the design builders panel are optional for those that want a lot of practice. Batting (fusible is O.K.) and backing 1 inches larger all the way around panel. At least two colors of quilting thread 30 or 40 weight (one dark, one light). A large variety of threads is great. 24" ruler. Straight pens. Quilting needles. Scissors. Bring supplies to make a plain 16 " muslin quilt sandwich to be assembled at retreat. You will learn many different quilting designs by creating a sampler. On this sampler you will learn how to fill this space with feathers, curved crosshatching, pebbles, micro stippling, layer bricks, small clam shells, a feathered wreath, continuous feathers, and more. Jackie will guide you through the process of creating each design. You will also learn how to fill the negative space and many background fills. When you finish the sampler you may bring one of your own quilts that you want to work on. Jackie will give you advice on how to choose a design that will enhance your quilt. You may want to bring extra muslin and batting to practice on before you start on your quilt. These are Jackie's newest samples to show techniques to learn.